Back in May, we mentioned some exciting news about this year’s, SharePoint Virtual Summit in Vegas. But a keynote favorite we’re all thrilled about, is Microsoft OneDrive’s new feature called, “Known Folder Move”. 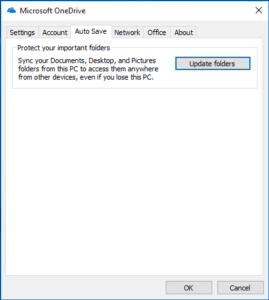 It’s where default folder locations on your Windows Desktop, Documents, & Pictures are automatically backed up & protected to OneDrive during both initial & post migration stages. An intelligent sync to a certain scale driven by cohesion, protection, & security. When enabled, saving files to OneDrive backs up the user’s data in the cloud & gives them access to their files from any device. 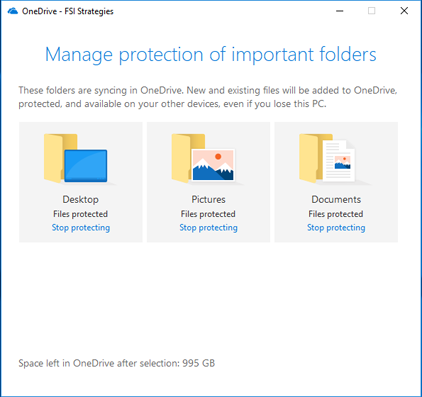 KFM (Known Folder Move) is now available to OneDrive users, so tap on it & set up folder protection now! Know more about Account Configuration, Migration, & Security – have our MS Cloud + Azure experts assist you in building the optimal IT environment.